April 22, 2019  Secretary of State Mike Pompeo is warning countries they could face U.S. sanctions unless they stop importing oil from Iran. April 22, 2019  Secretary of State Mike Pompeo on Monday announces an end to sanctions waivers it has granted countries that import Iranian oil, such as Japan and Turkey. April 12, 2019  Nearly a decade after WikiLeaks published thousands of diplomatic cables, one former ambassador describes it as "the toxic gift that keeps on giving." Diplomats spent years rebuilding trust with other governments. 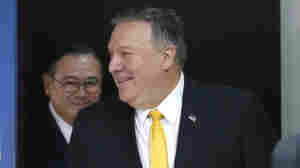 April 10, 2019  Secretary of State Mike Pompeo was back on the Hill Wednesday, defending budget cuts, including to Central America. He says aid is on pause until countries do more to stop migration. April 9, 2019  President Trump hosts the Egyptian President Abdel Fattah el-Sissi, whose government has a track record of killing or jailing thousands in an ongoing crackdown. The U.S. has been a major backer of him. April 8, 2019  The U.S. moved to list the Iran's Revolutionary Guard Corp as a terrorist group — an escalation of anti-Iran moves that critics say could leave U.S. forces vulnerable to other country's listings. April 4, 2019  NATO foreign ministers are gathered in Washington this week to mark the organization's 70th year. The head of NATO is appealing for trans-Atlantic unity at a time of tension. April 3, 2019  The State Department says it's carrying out President Trump's order to cut aid to Central America. But lawmakers say they're still waiting for details on a policy announced in a tweet. April 2, 2019  More than three years ago, the Egyptian military, using U.S.-made helicopters, mistakenly attacked a group of tourists — killing 12 people and wounding an American woman. March 27, 2019  "Russia has to get out" of Venezuela. That's the message President Trump is sending today after a Russian military contingent arrived, raising the stakes in this conflict and complicating U.S. policy. March 27, 2019  The U.S. Institute of Peace brings together experts from Vietnam and the U.S. For the U.S., it has meant hundreds of millions of dollars cleaning up former air bases where agent orange was stored. March 25, 2019  ISIS lost its last hold in Syria over the weekend. The Trump administration calls this a critical milestone in the effort to defeat the extremist group but says ISIS remains a threat in the region. February 26, 2019  A possible outcome of this week's U.S.-North Korea summit would be an exchange of liaison offices. These diplomatic posts are more limited than embassies. It would mark a step toward more normal ties. February 14, 2019  The Trump administration's point man on Venezuela was convicted of misleading Congress during the Iran-Contra affair. Abrams' past came up during a House hearing on Venezuela's political crisis.